Should the federal government stop encouraging Americans to eat more beef, pork, and cheese? The question for this new video (third in a series) is: Should the federal government stop encouraging Americans to eat more beef, pork, and cheese? For more information about reform of the federal commodity checkoff programs discussed in this video, see the bipartisan Opportunities for Fairness in Farming Act of 2017, introduced last year by Senators Mike Lee (R-UT) and Cory Booker (D-NJ). Parke Wilde - Federal Commodity Checkoff Programs from Tufts Friedman School on Vimeo. The House Farm Bill (H.R. 2) passed the Committee on Agriculture with only Republican votes and will soon go to the floor, where it faces strong criticism from Democrats who are concerned about the Supplemental Nutrition Assistance Program (SNAP) provisions. The provisions in question are widely described as "enhancing work requirements," which sounds like a good thing, but these provisions are very tough on working participants. An analysis by Dottie Rosenbaum at the Center on Budget and Policy Priorities (CBPP) today persuasively argues that the changes "are a bad deal for states and low-income households." One provision would require state agencies to ramp up employment and training programs to an unprecedented level, and it would reduce their ability to design these programs to meet local needs. Another provision would require up to 7 million working-age SNAP participants to report their weekly wages and hours is much greater detail, in order to enforce new benefit penalties for those who fall short. I fear this could yield a bureaucratic charade, with enormous investments in documenting the appearance of trying to work, taking participants away from their actual efforts to get on their feet in the private sector and taking program managers away from the main job of helping families get the resources they need to eat. The House proposal overlooks the great accomplishment of SNAP in recent decades, transforming a program that once had been just about safety net support for non-working families into a much more labor-market-friendly program that is open and accessible to working families as well. For example, at one time years ago, as Nader Kabbani and I found in the Journal of Human Resources, SNAP policy had perverse incentives for states to make the program less accessible to working people, in order to avoid the appearance of "errors" in benefit amount determination for families with fluctuating incomes. Later, important policy reforms streamlined the program's bureaucracy and simplified paperwork by allowing state agencies to determine the SNAP benefit amount for 6 months at a time, with less need for frequent reporting of minor changes in earnings. The new Farm Bill draft in the House reverses these changes, increasing the burden for program managers, and quite possibly deterring participation by working families with fluctuating incomes. I recognize that thoughtful people want able-bodied SNAP participants to stay connected with the labor market as much as possible, and I entirely agree. Recently, in a Q and A about the Farm Bill in Nutrition Today, Ph.D. student Mehreen Ismail and I summarized some of the research on this issue. More than 30% of all SNAP households had earnings from work in fiscal year 2015. This proportion was 55% among households with children. Most working SNAP participants are employed in low-wage occupations. By design, the SNAP benefit formula supports working households through its earned income deduction and benefit reduction rate. For every additional $1 of earned income, working households experience a $0.24 to $0.36 decrease in SNAP benefits, preventing a steep ‘‘cliff effect.’’ The 2014 Farm Bill authorized $200 million to pilot SNAP Employment and Training (E and T) programs. The E and T programs connect SNAP participants with skills training, job search assistance, subsidized employment, and more. Integrating strategies in a comprehensive, individualized way may enhance the E and T programs’ ability to lift unemployed or underemployed SNAP participants out of poverty. The best work-friendly safety net is one in which low-wage working people can participate in SNAP with a minimum of fuss, while working as hard as they can. In my view, the House Farm Bill seems less likely to make SNAP participants hard-working, and more likely just to make them hungry. Does the United States have a "cheap food policy"? In connection with the second edition of Food Policy in the United States: An Introduction (Routledge/Earthscan, 2018), here is the second video in a series. 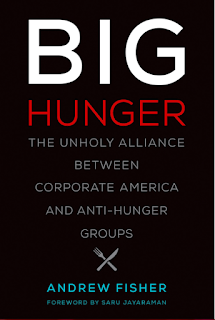 Today's question is: Does the United States have a "cheap food policy"? Parke Wilde - Does the United States Have a Cheap Food Policy? 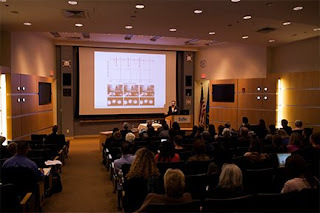 from Tufts Friedman School on Vimeo. broadly supporting SNAP overall (not thinking of SNAP as an excessively generous welfare program). The Bipartisan Policy Center's SNAP report this week in 2018 follows in the shoes of earlier conversations, such as the 2017 joint work of the American Enterprise Institute and Brookings, and the 2016 work of the National Commission on Hunger. 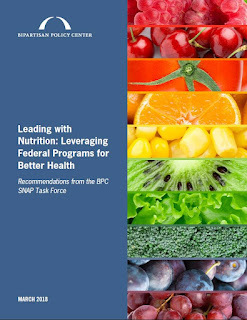 My Tufts Friedman School colleagues Norbert Wilson (as panel member) and Jerry Mande (as advisor) did great work on the BPC report, titled Leading with Nutrition: Leveraging Federal Programs for Better Health. Another panel member was Mariana Chilton, who also had made valuable contributions to the earlier National Commission on Hunger. Task force members shared an appreciation for the importance of SNAP in reducing food insecurity and poverty among low-income Americans. The program plays a positive role in supporting families and communities across the country; thus, it is our strong view that any changes to increase SNAP’s focus on nutrition and healthier food choices must be undertaken in ways that strengthen the program and make it more effective. Given that existing SNAP benefits are relatively meager (less than $1.39 per person per meal), we strongly oppose any changes that would reduce the value of SNAP benefits or make them more difficult for qualified individuals to access. You may think such reports bland, but I think quite well of them. I would be happy to trade our current political environment for the more sedate political world these commissions inhabit. 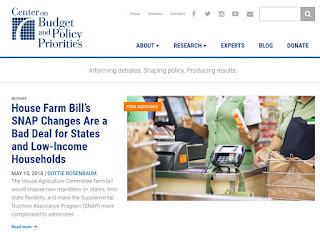 The BPC could not have anticipated -- and certainly did not directly comment on -- the administration's entirely distinct budget proposal, including harsh SNAP cuts and a Harvest Box proposal, which may be more central to the national SNAP policy argument this year. 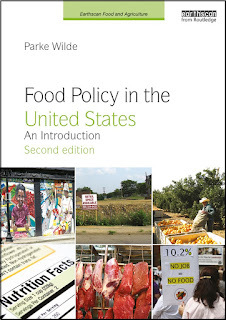 The book Food Policy in the United States: An Introduction, whose second edition has just been released in the Earthscan Food and Agriculture Series (Routledge), prepares readers to make their own distinctive contribution to a lively conversation about our food system. There is no reason why food policy debate should continue to mirror the current dysfunctional state of our national political debate. We can do better. The first in a series of related videos asks: Who should study U.S. food policy? Routledge provides a free sample chapter on the author Q&A page. The federal district court in Washington, DC, yesterday stopped the $3 million annual payments that the federal government's semi-public pork checkoff program makes to the National Pork Producers Council (NPPC), a private trade association, for the purchase of the "Other White Meat" slogan. The ruling confirms something that I have been reporting for a dozen years. In 2006, the pork checkoff program first announced plans to purchase the industry's own slogan from NPPC for $60 million, in payments of $3 million per year for 20 years. At the time, I noted that USDA was keeping the financial appraisal secret. I had serious doubts that the slogan could be worth such a sum, because who else but the pork board would want to buy it? Were the artichoke producers vigorously bidding up the price for the "Other White Meat" slogan? It seemed clear what was really going on. The semi-public checkoff program, which is established by Congress and overseen by USDA, must follow rules such as never using its money for lobbying or other types of political influence. The inflated payments circumvented these rules, allowing the checkoff program to shift $3 million each year to the private trade association, without expecting any actual goods or services in return. This pork industry plan seemed bad for the public interest and bad for pork farmers whose mandatory payments fund the checkoff program. A new report this week from the Government Accountability Office (GAO) says more broadly that checkoff programs have shortcomings in transparency and in USDA oversight of contracting. Over the years, I requested the appraisal under the Freedom of Information Act (FOIA), but USDA refused my request and then on appeal just sent censored documents with the actual financial details blacked out. The Humane Society of the United States (HSUS) was finally given the actual appraisal many years later, and, as expected, it fell far short of justifying the sale price. Many years have passed, and the federal district court yesterday said the initial 2006 sale -- however bad it may be -- now falls under a statute of limitations. But, the court allowed the plaintiffs, including HSUS and a pork farmer in Iowa, to question a USDA decision in 2016 to continue the payments. By that time, USDA had a new appraisal, which had the same problems as the earlier appraisal. The Secretary approved spending $3 million per year for the purchase of the trademarks for another ten years based on an expert’s determination of their replacement cost, that is, what it would cost to develop and market an entirely new promotional campaign today. But neither the agency nor the expert adequately explains why this calculation sheds any light on what the 2016 review was supposed to ascertain: the current value of the set of four trademarks to the agency. The fundamental problem is that the three trademarks that include The Other White Meat slogan have been declared to be obsolete, and they have been retired from active use. So their value is minimal, or at best, undetermined. And the record contains no effort to ascertain the value of the fourth mark – the “Pork and Design” logo that consists of the word “pork” written across a blue triangular “pork loin silhouette” – at all. The Secretary’s 2016 decision also fails to explain why it makes sense to predicate future payments on the cost of replacing The Other White Meat when the cost of replacing The Other White Meat has already been incurred. Moreover, while the agency states that the expert endeavored to calculate the value of the marks based upon the cost of developing a new trademark with the same level of effectiveness as the old trademarks, “as measured by aided awareness studies of the percentage of people who are aware of the trademark,” there is no data in the record underlying the expert’s selection of 40% awareness as the target measure. The expert simply cut the high level of awareness garnered by The Other White Meat slogan in its heyday in half and calculated what it would cost to buy something else that effective now. But without any analysis of how much The Other White Meat still resonates in the consumer consciousness today, or, more important, whether the blue triangular logo has gained any traction in the market at all, this approach to quantifying “current value” is completely arbitrary and cannot pass muster under the APA. Although the pork industry and USDA surely will appeal the decision, it is pleasing to see the problem with this payment stated so clearly by a federal court. New research released yesterday from leading agricultural economists Glynn Tonsor, Jayson Lusk, and Ted Schroeder finds that growing media coverage and consumer concern about climate change and the environment would lead to lower demand for beef. The new report somewhat pushes back against a long tradition of economic research emphasizing prices as a key determinant of consumer demand. The authors, economists at Kansas State and Purdue, show that the impact of beef prices has declined over the years. They find that pork and chicken prices affect beef demand less than one might expect from prior research. They argue that media coverage, consumer demographics, and consumer "values" may matter more. The study is based in part on consumer survey data and in part on an econometric analysis of beef sales data, market prices, and indices of media coverage for many topics. The survey analysis found that consumers who value convenience, taste, and appearance have higher demand for ground beef. 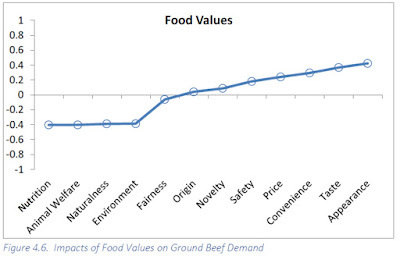 By contrast, consumers who value nutrition, animal welfare, naturalness, and the environment have lower demand for ground beef. Source: Tonsor, Lusk, and Schroeder, 2018. The econometric analysis found that beef demand declined in the 1990s and again in the Great Recession, but it has been rebounding recently from 2011-2017. In older years, much of the coverage in the media data concerned nutrient content issues such as zinc and protein. In recent years, the leading topic in the data is climate change. The study reported elasticities, showing the percentage change in quantity demanded in response to each 10% change in an explanatory variable. 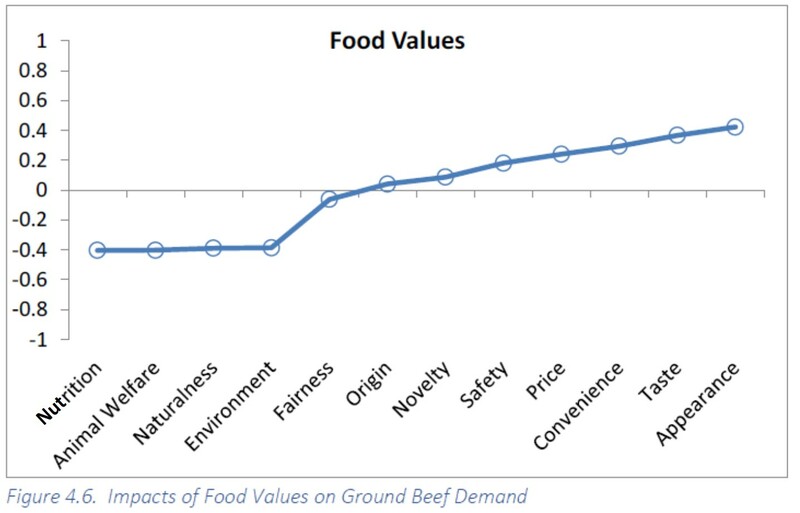 In recent years, each 10% increase in coverage of beef taste, tenderness and flavor was associated with a 5% increase in beef demand. By contrast, each 10% increase in coverage of climate change was associated with a 2% reduction in beef demand. The study paid attention to the amount of media coverage, and to variation from one month to the next. Although media coverage of climate change was high in recent years, it did not jump around much from one month to the next. So, the study could not show definitively whether climate change coverage will strongly influence future changes in beef demand. Much depends on whether media coverage of climate change stays constant or increases over time. The findings about environmental values and climate change are notable, because consumers may become more aware in the next several years that climate change is a critical global challenge. The journal Climatic Science reported in 2014 that reduced beef and dairy consumption is "indispensable for reaching the 2 °C target with a high probability, unless unprecedented advances in technology take place." The findings about nutrition also are interesting. There is strong evidence to recommend reduced consumption of some meat products, such as processed meat. The nutrition science community has a vigorous ongoing debate about recommendations about meat intake more broadly. The most recent Dietary Guidelines Advisory Committee report recommended a healthy dietary pattern that is higher in vegetables, fruits, whole grains, and several other components, and "lower in red and processed meat." The beef demand report released yesterday was funded by the Cattlemen's Beef Board, one of several major federal government checkoff partnerships designed to increase consumer demand for beef, pork, and dairy products. These checkoff programs were established by Congress, are overseen by USDA, managed by an industry board, and funded by a mandatory assessment or tax on producers. The federal government enforces collection of the assessment. With total funding of more than half a billion dollars annually, these boards are much larger than any federal initiatives to promote healthy eating or consumer lifestyle change to protect the environment. The Cattlemen's Beef Board and its primary contractor, the National Cattlemen's Beef Association (NCBA), heard preliminary results in 2017 and were "invited to provide feedback guiding the remainder of the project." In the final report, the authors advise the industry on how to keep increasing beef demand. One specific household characteristic of note is how African-American and Hispanic residents exhibit strong desire for beef. As the share of the U.S. population comprised of these two races is projected to grow refined focus on specific desires of these groups is warranted. As an economist in a nutrition school, I think the federal government's semi-public checkoff programs should avoid that approach [edited Feb 1], during a time of great concern about health disparities for Americans of different races and ethnicities. But, one can see how the analysis would tempt the beef industry to consider this approach. Issues including safety and climate were found as current demand detriments. Ultimately the feasibility of impacting these areas must be considered before final decisions regarding industry investment are made. As the climate changes, it is conceivable that media coverage will ignore the impact of food choices, and that consumer awareness will be stagnant. It also is possible that more sectors of the media will take climate change seriously, and more consumers will come to appreciate the flavors and nourishment of lower-carbon food choices. In this second scenario, this study shows that the agricultural economy may need to accept and adapt to a reduction in per capita beef demand.